Cosmological fact and fiction – Physics says what? In the last few months, I’ve been struck by how many articles have been published in the popular media and science news about black holes and the Big Bang. Mainstream physics and science communications (like phys.org, quantamagazine.org, etc) lately seem to be discussing more and more “mind blowing” geometries of the universe (or multiverse, eh). Of course, the topic of black holes always has been glamorous, a darling of the media and a touchstone of physics . Lots more articles on the massive black hole at the center of our very own galaxy. Lots more speculation about interactions near black holes. Merging of black holes , wandering black holes, white holes, etc. 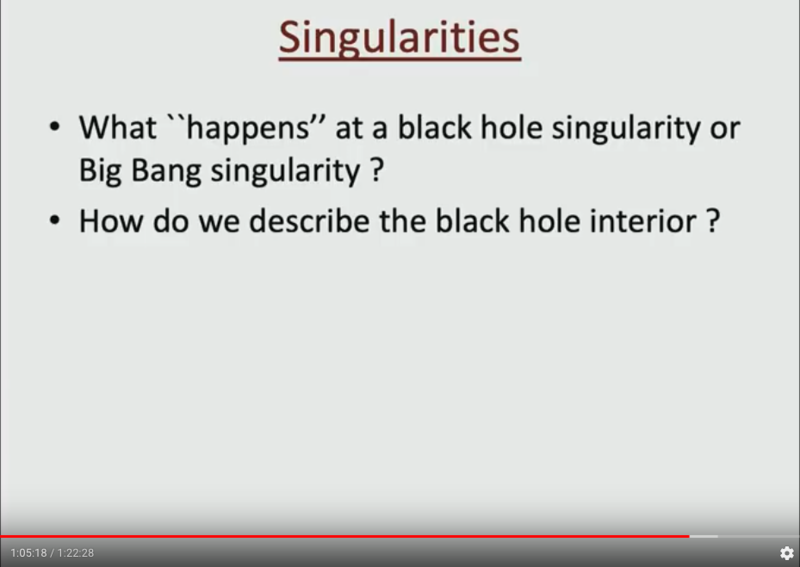 The reality and fiction of singularities. The discovery of gravity waves by LIGO (as well as marketing of big science) may have broadened the appeal of massive cosmological events. Newsworthiness. As for the Big Bang, there’s been more speculation about the character (and language) of spacetime before and after that event. Mirror positive and negative universes arising from such an event . Multiverses of big bangs. The rise and end of the universe. But for scientists and science communicators there’s also the challenge of what the physics really says versus the hype, speculation, and claims of both story tellers and scientists (physicists). The science versus commentary about the science. Consensus versus open topics of active research. What makes for an interesting interview may stretch theory or become more about personality than the facts. This distinction between ontic and epistemic viewpoints is the Big Divide for interpretations of quantum mechanics. It’s where you must reveal your true colours. Does the wavefunction express a limitation on what can be known about reality, or is it the only meaningful definition of reality at all? — Ball, Philip. Beyond Weird (p. 55). University of Chicago Press. Kindle Edition. The same may be said for cosmology. In particular, for stories about the origin of the universe. Or whether terms like “origin” or “creation” even apply. And the limits of language to even discuss the topic. The entangled ‘verse … 10^n and 10^-n. So, where does that leave us regarding the big picture? Well, that’s why Sean Carroll’s latest blog post caught my attention: “True Facts About Cosmology (or, Misconceptions Skewered)” (January 12, 2019). While I’m still unsure about his position on the multiverse, I admire his ongoing effort to clarify cosmological fact versus fiction, state of knowledge versus conjecture — defend against the “zone” being flooded with nonsense (to speak politely). In his post, Carroll lists 19 talking points (below). (Bolding and ’s are mine.) Comments on his post are interesting also. People sometimes also use “the Big Bang” as shorthand for “the hot, dense state approximately 14 billion years ago.” I do that all the time. That’s fine, as long as it’s clear what you’re referring to. 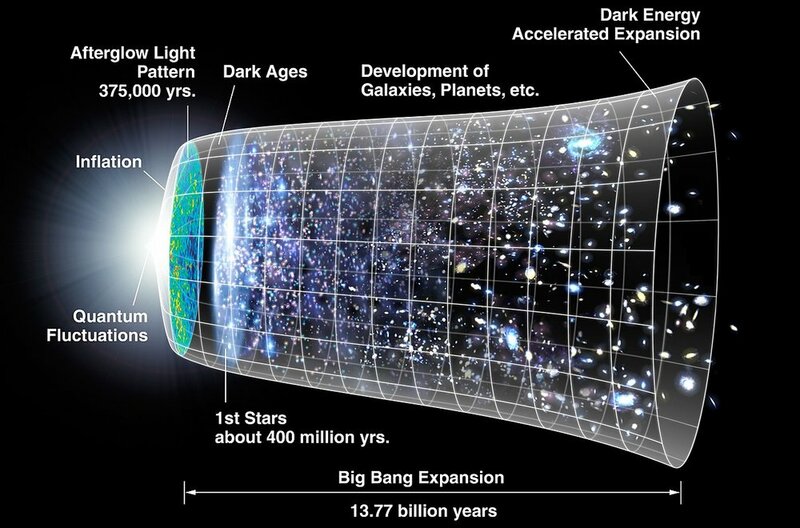 The Big Bang might have been the beginning of the universe. Or it might not have been; there could have been space and time before the Big Bang. We don’t really know. The Borde-Guth-Vilenkin theorem says that, under some assumptions, spacetime had a singularity in the past. But it only refers to classical spacetime, so says nothing definitive about the real world. The universe did not come into existence “because the quantum vacuum is unstable.” It’s not clear that this particular “Why?” question has any answer, but that’s not it. The universe isn’t expanding “into” anything, as far as we know. 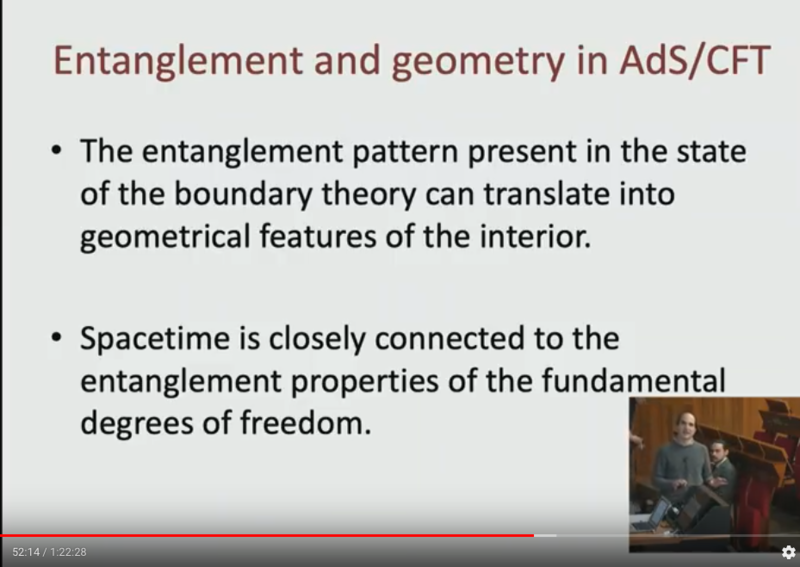 General relativity describes the intrinsic geometry of spacetime, which can get bigger without anything outside. Inflation, the idea that the universe underwent super-accelerated expansion at early times, may or may not be correct; we don’t know. I’d give it a 50% chance, lower than many cosmologists but higher than some. The early universe had a low entropy. It looks like a thermal gas, but that’s only high-entropy if we ignore gravity. A truly high-entropy Big Bang would have been extremely lumpy, not smooth. Dark matter exists. Anisotropies in the cosmic microwave background establish beyond reasonable doubt the existence of a gravitational pull in a direction other than where ordinary matter is located. We haven’t directly detected dark matter yet, but most of our efforts have been focused on Weakly Interacting Massive Particles. There are many other candidates we don’t yet have the technology to look for. Patience. Dark energy may not exist; it’s conceivable that the acceleration of the universe is caused by modified gravity instead. But the dark-energy idea is simpler and a more natural fit to the data. We have a perfectly good, and likely correct, idea of what dark energy might be: vacuum energy, a.k.a. the cosmological constant. An energy inherent in space itself. But we’re not sure. We don’t know why the vacuum energy is much smaller than naive estimates would predict. That’s a real puzzle. Neither dark matter nor dark energy are anything like the nineteenth-century idea of the aether. Ushma S. Neill, PhD, is vice president, Office of Scientific Education and Training, Memorial Sloan Kettering Cancer Center. Because attributing depth to scientists and giving full freight to the scientific process is not as handy, the way the public sees science is skewed. Much as the relationship between astronomy and astrology. Astronomy has, as its most prominent pseudoscience, astrology—the discipline out of which it emerged. The pseudosciences sometimes intersect, compounding the confusion … — Sagan, Carl. The Demon-Haunted World: Science as a Candle in the Dark. Random House Publishing Group. Kindle Edition. Loc 799. There’s a great deal of pseudoscience for the gullible on TV, a fair amount of, medicine and technology, but hardly any science—especially on the big commercial networks, whose executives tend to think that science programming means ratings declines and lost profits, and nothing else matters. There are network employees with the title “Science Correspondent,” and an occasional news feature said to be devoted to science. But we almost never hear any science from them, just medicine and technology. When is the last time you heard an intelligent comment on science by a President of the United States? Why in all America is there no TV drama that has as its hero someone devoted to figuring out how the Universe works? — Ibid. Loc 5863. Modern Roman Catholicism has no quarrel with the Big Bang, with a Universe 15 billion or so years old, with the first living things arising from prebiological molecules, or with humans evolving from apelike ancestors—although it has special opinions on “ensoulment.” Most mainstream Protestant and Jewish faiths take the same sturdy position. — Ibid. Loc 4442. Gravity causes the universe to accelerate because gravity is not always attractive. Roughly speaking, the “source of gravity” is the energy density of a fluid plus three times the pressure of that fluid. Ordinary substances have positive energy and pressure, so gravity attracts. But vacuum energy has negative pressure, equal in size but opposite in sign to its energy. So the net effect is to push things apart. 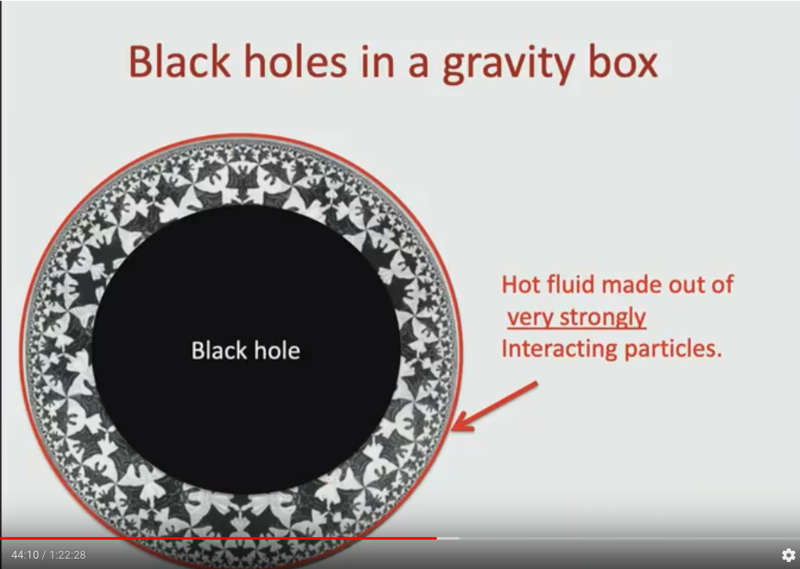 Here’s an interesting visualization of the merger of 2 black holes on the Caltech YouTube channel: “Colliding and Wobbling Black Holes” (January 24, 2019). This simulation shows the merging of a 20 solar-mass black hole with a 40 solar-mass black hole. A new model now predicts the end state of a merger with the greatest accuracy yet, including the final black hole’s spin, mass, and recoil velocity, or “kick.” The black holes’ spins are indicated with arrows—because they differ from the orbital angular momentum (pink arrow), the orbit wobbles, or precesses. The blue and red orbs indicate patterns of gravitational waves generated in the collision. 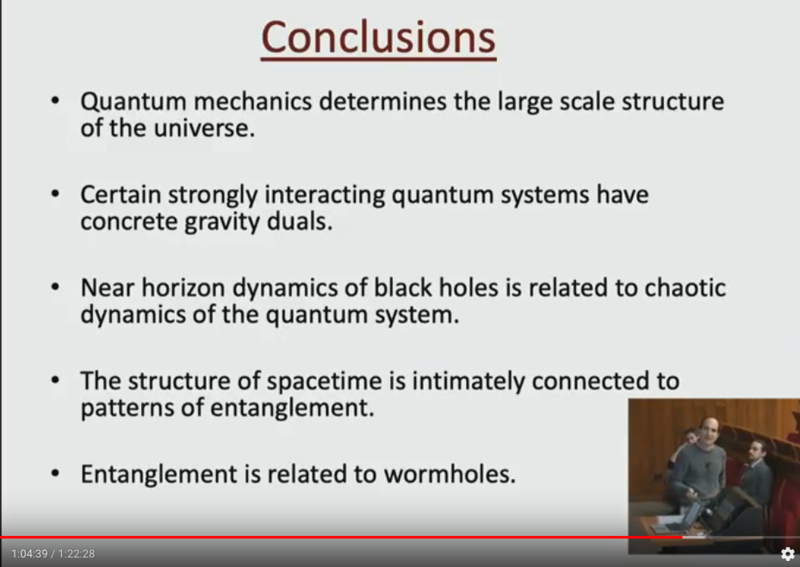 Here’s an excellent summary of the history of research regarding black holes on the Caltech YouTube channel (March 30, 2016) — a lecture by Kip Thorne from the General Relativity at One Hundred: The Sixth Biennial Francis Bacon Conference in March 2016. Wonderful visualizations. Background on the physics of the film Interstellar. One of the seminal aspects of modern cosmology celebrates an anniversary this year, as noted in this Live Science article “The Day Edwin Hubble Realized Our Universe Was Expanding” (January 17, 2019). What Hubble and his co-authors had observed was the very expansion of the universe itself. To use a famous analogy, the galaxies are like raisins in the bread dough of the universe. As the dough rises, all of the raisins move farther apart, but they’re all still stuck in the same dough. The discovery enabled the calculation of the age of the universe: about 13.7 billion years old. An interesting question regarding the Big Bang and an expanding universe: “Does the Universe Have a Center?” (October 2, 2018). The Big Bang was the explosion that started it all. Explosions have centers. Therefore our universe has a center, right? Well, no. Not exactly. The Big Bang theory is currently the best explanation of how our universe came to be: an explosion that created everything, including time, matter, and space itself. This explosion caused the expansion of the universe. However, the words “explosion” and “expansion” in the previous sentence are misleading. It is not an explosion in the conventional sense, where energy is released into space; rather, it is the rapid expansion of space itself. As already noted regarding the expansion of the universe, there’s the raisins in rising dough analogy. This article also presents the balloon analogy and what the observable universe is. And regarding the centers of galaxies, black holes evidently abound in the center of our Milky Way according to this NPR article: “Center of the Milky Way Has Thousands of Black Holes, Study Shows” (April 4, 2018). … Chuck Hailey, an astrophysicist at Columbia University … and his colleagues recently went hunting for black holes, using observations of the galactic center made by a NASA telescope called the Chandra X-ray Observatory. Here’s an interesting Space.com article by Don Lincoln, Senior Scientist, Fermi National Accelerator Laboratory; Adjunct Professor of Physics, University of Notre Dame: “Did ‘The Big Bang Theory’ Get the Science Right? A Lesson in Supersymmetry and Economy Class” (January 24, 2019). He compares the physics portrayed in a recent episode of the hit television show “The Big Bang Theory” with real science. So this episode was brought to my attention because … well … Fermilab. Fermilab is a real place. I drive to it every morning in Batavia, Illinois. … I thought people might be interested in learning about what was true and what wasn’t in this episode. Science on television is rarely exactly right and that’s OK. Most television is supposed to be entertaining. But it’s nice when they can incorporate some real science into it. 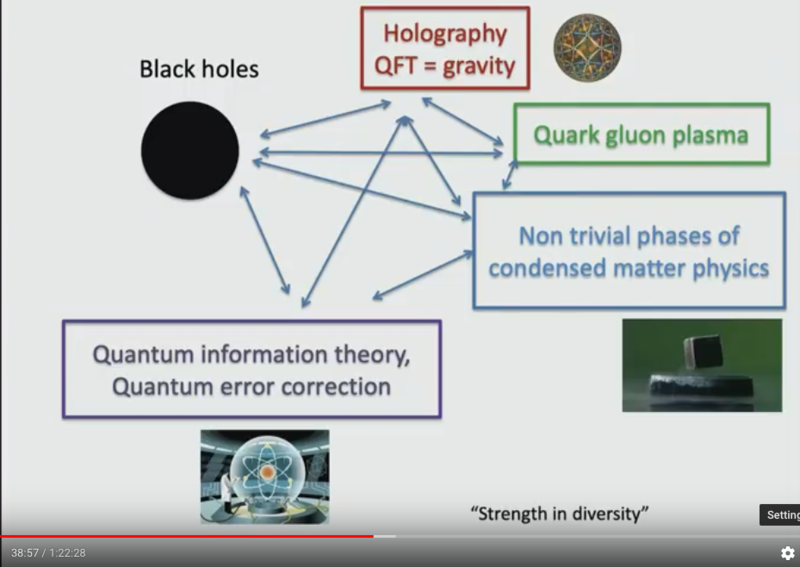 Sean Carroll’s blog post “Intro to Cosmology Videos” (May 14, 2018) has links to CERN videos of lectures he gave there in 2005. These are slightly technical — at the very least they presume you know calculus and basic physics — but are still basically accurate despite their age. Here’s another take on the fact and fiction of black holes, an article in Quanta Magazine: “The Double Life of Black Holes” (January 29, 2019). The story of black holes began in 1916, when Karl Schwarzschild discovered a solution to Einstein’s equations of general relativity that is able to trap light. Initially, physicists thought of Schwarzschild’s finding as … a purely mathematical possibility … [but] in 1935, Subrahmanyan Chandrasekhar showed that when a big star runs out of nuclear fuel, … nothing can prevent the star from collapsing to a black hole. … black holes became a scientific possibility. … In the 1960s, Stephen Hawking and Roger Penrose proved that black holes can be created in stellar collapse under quite general circumstances. … in the mid-1990s, observations from the center of our Milky Way revealed an object (Sagittarius A*) for which no other explanation than a black hole seemed plausible. And in the past 20 years, evidence for black holes has become overwhelming. Astrophysicists discovered that not only our own galaxy, but most galaxies, harbor them. Black holes have been seen to eat gas and stars and to act as gravitational lenses. Their existence is no longer controversial. String theorists … like to study black holes in universes with a negative cosmological constant (the so-called Anti-de Sitter spaces). 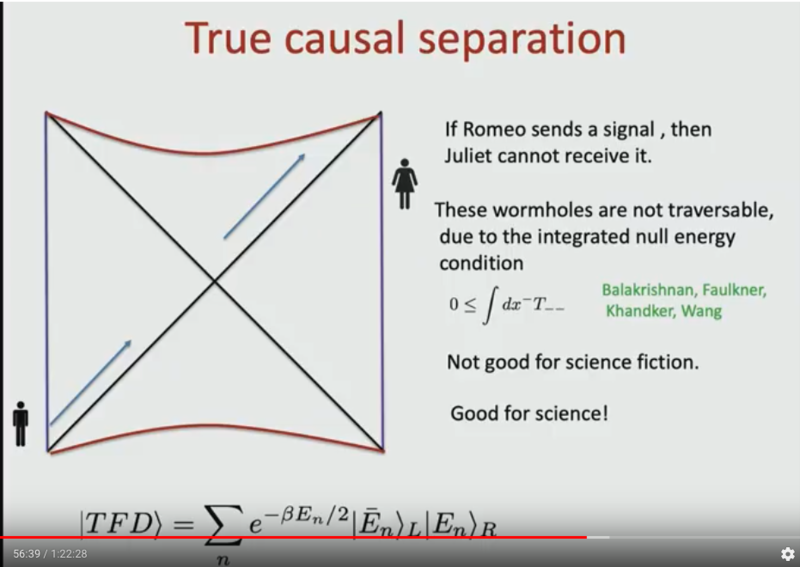 This YouTube video lecture (Int’l Centre for Theoretical Physics streamed live on Jan 28, 2019) by a well-known theoretical physicist (Juan Maldacena, Institute for Advanced Study, IAS, Princeton, USA) provides a useful background on research regarding black holes and the Big Bang: “Lecture 1: Quantum mechanics and the geometry of spacetime” (Salam Distinguished Lectures 2019). Key concept: Classical harmonic oscillator vs. quantized (QM) oscillator. Coupling between harmonic oscillators — between bosons (in QFT) and matter (fermions) — and the geometry of spacetime. Bosons and fermions (quarks, leptons). Example: An electron is a lepton (fermion). Wiki: A hadron is a composite particle made of two or more quarks held together by the strong force in a similar way as molecules are held together by the electromagnetic force. Most of the mass of ordinary matter comes from two hadrons, the proton and the neutron. [The cosmic microwave background] has been closely analyzed via the same basic physics used to study the structure of the sun. 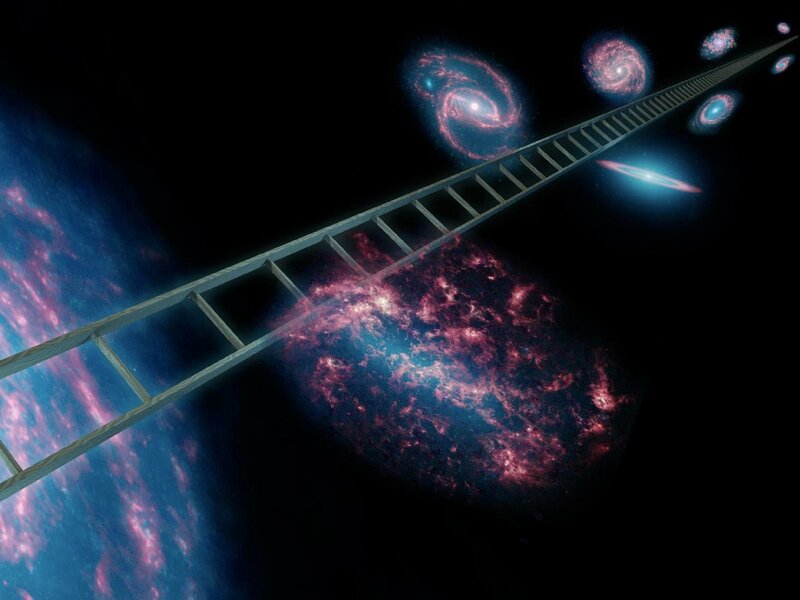 In fact, the primordial reverberation is so well measured and modeled that it has been used to deduce the precise rate at which the universe is expanding, a number known as the Hubble constant. That constant, in turn, is the cornerstone of our modern understanding of the size, age and structure of the cosmos. Just as you can intuit the qualities of a bell from the way it rings (a small glass bell sounding entirely different than a large brass one), researchers can infer the precise properties of the universe from its sounds as recorded in the microwave background. And here’s yet another Phys.org article on research which may settle the “expansion problem” and the Hubble constant: “Gravitational waves will settle cosmic conundrum” (published February 14, 2019). Measurements of gravitational waves from approximately 50 binary neutron stars over the next decade will definitively resolve an intense debate about how quickly our universe is expanding, according to findings from an international team that includes University College London (UCL) and Flatiron Institute cosmologists. And here’s another article by Ethan Siegel, Forbes Senior Contributor, on the question “This Is Why We Aren’t Expanding, Even If The Universe Is” (February 19, 2019). The reason for this is subtle, and is related to the fact that the expansion itself isn’t a force, but rather a rate. Space is really still expanding on all scales, but the expansion only affects things cumulatively. There’s a certain speed that space will expand at between any two points, but you have to compare that speed to the escape velocity between those two objects, which is a measure of how tightly or loosely they’re bound together. The fabric of space itself may still be expanding everywhere, but it doesn’t have a measurable effect on every object. If some force binds you together strongly enough, the expanding Universe will have no effect on you. It’s only on the largest scales of all, where all the binding forces between objects are too weak to defeat the speedy Hubble rate, that expansion occurs at all.